IsoEnergy has a total of 14 properties in their growing portfolio. Of these, five were spun out from NexGen, three were acquired by IsoEnergy and a further six were incorporated into the portfolio through staking. Thirteen of IsoEnergy’s properties are located in the Athabasca Basin, and the company is primarily focused on developing its Larocque East, Geiger, Radio and Thorburn Lake properties. The company’s Larocque East property is a highly prospective uranium exploration property that contains a 15 kilometer portion of the Larocque Lake conductor system. In a recent drill program, the company discovered the Hurricane Zone, which hosts an intersection containing a broad 8.5 meter long interval that averages 1.26 percent U3O8 and included a higher-grade sub-interval of 3.58 percent U3O8 over 2.5 meters. The Geiger property covers 12,593 hectares of the Athabasca Basin after IsoEnergy expanded the property in late 2017 and early 2018. During a drilling program conducted in January 2018, a 15 meter interval with an average grade of 0.03 percent U3O8, 2,600 ppm copper, 998 ppm nickel, 943 ppm zinc and 2.4 g/t silver was discovered. The Thorburn Lake project is located 7 kilometers east of and on trend with Cameco Corporation’s (TSX:CCO) Cigar Lake mine. The Cigar Lake mine has a reported mineral reserve of 221.6 million pounds grading 16.7 percent U3O8. IsoEnergy is continuing its exploration of the property and considers it to be highly prospective for uranium deposits. Finally, IsoEnergy’s wholly-owned Radio property is directly adjacent to and on strike with the Roughrider uranium deposit which was acquired by Rio Tinto (LSE:RIO;ASX:RIO;NYSE:RIO) in February 2012. The property also hosts a large magnetic low corridor that may host extensions of the structures found at the Roughrider deposit. NexGen is a major shareholder with 58.93 percent of IsoEnergy’s shares and has representatives on IsoEnergy’s board of directors. The team at NexGen was responsible for discovering and developing the Arrow deposit, which has an indicated resource of 179.5 million pounds of U3O8 contained within 1.18 million tonnes grading 6.88 percent U3O8 and an inferred resource of 122.1 million pounds of U3O8 contained within 4.25 million tonnes grading 1.30 percent U3O8. IsoEnergy has the support of an experienced exploration team with a track record of success in targeting basement-hosted mineralization. Additionally, the IsoEnergy team, including NexGen founders and board of directors, have been involved in the discovery of two significant uranium ore bodies and over 400 million pounds of U3O8. Notably, major shareholders and insiders hold approximately 75 percent of the company shares. Focused on finding and developing high-grade uranium projects in the vicinity of the Athabasca Basin’s major high-grade uranium deposits. Portfolio of highly prospective uranium properties in the Athabasca Basin in Saskatchewan. 3,200-hectare Larocque East project hosts approximately 22 kilometers of graphitic conductors. Hurricane Zone at Larocque East shows results of 3.58 percent U3O8 over 2.5 meters within 8.5 meters of 1.26 percent U3O8; mineralization remains open along strike. Significant shareholder NexGen Energy holds 58.93 percent of the company shares. Led by a team of highly skilled uranium professionals with experience spanning exploration, development and production. Traditionally, exploration in the Athabasca region has consisted of evaluating electromagnetic (EM) conductors with single vertical drill holes that are spaced 800 meters apart. If the holes intersected altered or weak mineralization, they were followed up with more drill holes that are spaced 200 meters apart and if these holes were unsuccessful the drill would be moved to the next conductor. 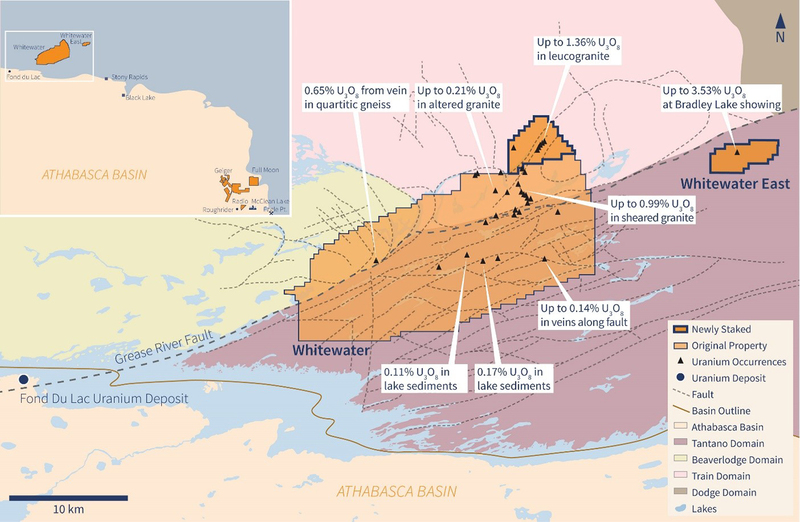 Most of the conductors in the Athabasca Basin have been evaluated using the traditional model, which has led to the major discoveries at McArthur River and Cigar Lake, among others. However, the traditional model has certain limitations and has missed basement hosted mineralization at the Arrow, Gryphon, Roughrider and Millennium deposits. To target areas that are not covered by the traditional model, IsoEnergy has taken a different approach to discovering uranium deposits. The company drills at an angle so they can reach as much of the basement as possible and they conduct extensive testing of zones of weak unconformity alteration and mineralization for their basement-hosted potential. The company’s team pairs their due diligence with their experience to interpret structural geology, clay alteration and trace element geochemistry to identify high-grade uranium along graphitic structures beneath the unconformity. The Arrow, Gryphon and Roughrider deposits were all discovered this way. The wholly-owned Larocque East property is made up of six claims that total 3,200 hectares. It was purchased from Cameco Corporation in May 2018 and sits in the Athabasca Basin in Saskatchewan. The property is 35 kilometers northwest of Orano Canada’s McClean Lake uranium mine and mill. The property overlaps 15 kilometers of the northeast extension of the Larocque Lake conductor system. The system is a trend of graphitic metasedimentary basement rocks associated with significant uranium mineralization to the southwest of the property. Instances of this phenomenon include the Larocque Lake and Larocque North zones, which sit 6.5 and 0.4 kilometers southwest of the Larocque East boundary, respectively. 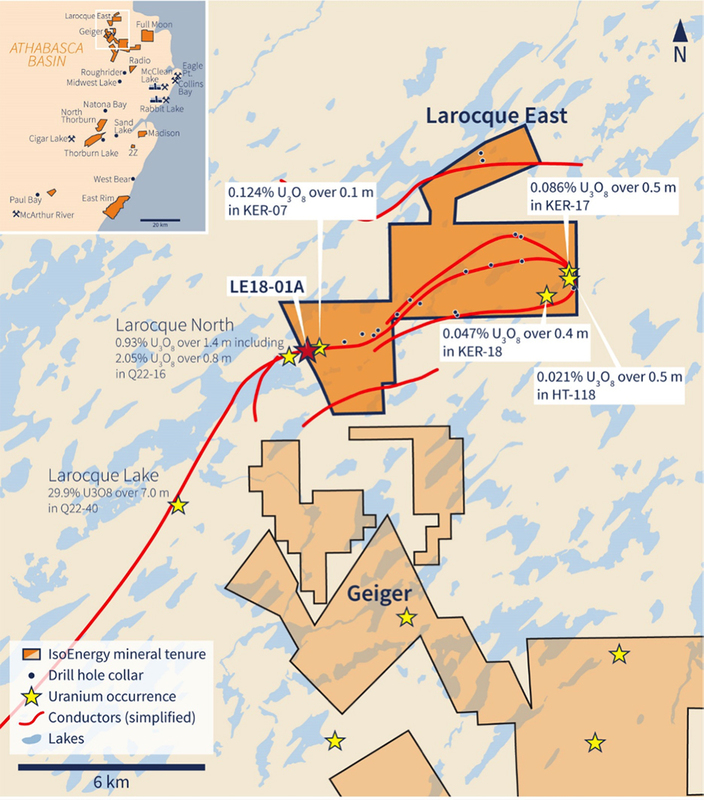 The Larocque Lake zone boasts historic intersections of up to 29.9 percent U3O8 over 7.0 meters, and drilling at Larocque North presented results of up to 2.05 percent U3O8 over 0.8 meters. The Larocque East property also sits adjacent to the Wollaston-Mudjatik transition zone, which is a significant crustal suture tied to a majority of the major uranium deposits in the Eastern Athabasca Basin. The region also hosts thin sandstone cover of between 140 and 330 meters. Larocque East has previously been evaluated with 23 historic drill holes that were completed along 22 kilometers of graphitic conductors. Five zones of weak uranium mineralization were intersected in the historic drilling, including 0.12 percent U3O8 over 0.1 meter and 0.06 percent U3O8 over 0.5 meter. As part of IsoEnergy’s summer work program, where the company also drilled seven holes at the Geiger property, a hole was drilled at Larocque East which intersected a broad 8.5 meter long interval that averaged 1.26 percent U3O8 and included a higher-grade sub-interval of 3.58 percent U3O8 over 2.5 meters. Additionally, the higher-grade sub-interval contains a zone containing off-scale radioactivity that averages 6.45 percent U3O8 over one meter. The mineralization from the intersection is associated with clay and hematite surrounded by hydrothermal alteration envelopes. The mineralization remains open along strike, limited only in one direction by the property boundary 165 metres to the southwest. In August 2017, IsoEnergy entered into an agreement with AREVA Resources Canada (now Orano Canada), Cameco Corporation and JCU Exploration Company Ltd. (Canada) to acquire a 100 percent interest in the three mineral claims that comprised the initial 4,188 hectares Geiger property in the Eastern Athabasca Basin in Saskatchewan. The property is located 13 kilometers northwest of IsoEnergy’s Radio property and is within 20 kilometers of the Roughrider and Midwest deposits as well as Orano’s McClean Lake uranium mine and mill. Since the initial acquisition, IsoEnergy has further expanded the property through the staking of an additional 1,605 hectares in November 2017, as well as the acquisition of 33 claims from Cameco’s Dawn Lake property in March 2018. Following these additions, the total land package for the Geiger project measures 12,594 hectares. A total of 56 drill holes have been completed at Geiger along many kilometers of graphitic conductors. Historic drill results include 2.74 percent U3O8 over 1.2 meters in drill hole HL-50. However, the property requires additional exploration as there are several other intersections of weak uranium and numerous untested conductor gaps present across the property. IsoEnergy completed a winter drill program in January 2018 which successfully extended known mineralization in two locations on the property. Within a 19.3-meter interval of elevated radioactivity, a 15-meter interval averaged 0.03 percent U3O8, 2,600 ppm copper, 998 ppm nickel, 943 ppm zinc and 2.4 g/t silver. This broad interval includes individual samples with up to 14,700 ppm copper, 3,130 ppm nickel, 407 ppm cobalt, 3,670 ppm zinc and 6.4 g/t silver. A second, narrower zone of uranium mineralization was intersected deeper in the basement. It consists of a 0.7-meter interval that averages 0.02 percent U3O8 and 795 ppm copper from a depth of 251.8 to 252.5 meters. IsoEnergy holds a 100 percent interest in the Thorburn Lake Property which is located 7 kilometers east of and on trend with Cameco’s Cigar Lake mine and the nearby Thorburn Lake and Wolf Lake uranium deposits. Cameco’s Cigar Lake mine has a reported mineral reserve of 221.6 million pounds grading 16.7 percent U3O8. The Cigar Lake mine haul road runs through the property. Additionally, the property sits within 300 meters of the Thorburn Lake uranium occurrence, which has reported numerous significant intersections including 3.2 percent U3O8 over 8.8 meters. In 2008 and 2011, previous owners drilled 14 holes on the property, nine of which intersected elevated uranium geochemistry and/or strong alteration commonly found near uranium deposits. Highlights from the results include an intercept of 0.43 percent U3O8 over 0.6 meters. A four-kilometer-long conductive zone is present and hosts known mineralization on and adjacent to the property. This target area runs the whole length of the southern boundary of the Thorburn Lake property. Between 2016 and 2017, IsoEnergy drilled 16 holes for a total of 7,100 meters. The drill program targeted extensions of the mineralization identified in 2011. Several new drill targets have been generated after IsoEnergy completed its 2017 geophysical survey on the unexplored southwestern half of the property. Future work on the Thorburn Lake property will include follow-up drilling based on the 2016 and 2017 drilling campaigns as well as remaining drill targets identified by the geophysical survey done in 2017. IsoEnergy believes that the property remains highly prospective for both unconformity and basement hosted uranium mineralization and will continue to explore the property further. The North Thorburn property is located 5 kilometers northwest of the Thorburn Lake property and is 12 kilometers northeast of and along strike of the Cigar Lake mine. The Cigar Lake mine access road runs along the western border of the property. While North Thorburn remains underexplored, it does host several high priority targets that are worthy of follow up exploration. In October and November 2016, IsoEnergy completed 50 kilometers of DC-resistivity geophysical surveying on the property. Four resistivity low anomalies were discovered in the western and northeastern parts of the survey area. Additionally, results coincided with interpreted structures from previous geophysical surveys and offer the company multiple drill targets for future work programs. IsoEnergy has a 100 percent interest in the Radio property which is directly adjacent to and along strike with Rio Tinto’s Roughrider uranium deposit. Radio is also within 50 kilometers of the Rabbit Lake and McClean Lake uranium mills. Other uranium deposits in the area include Dawn Lake and Midwest. In 2013, NexGen completed a summer work program that included detailed airborne magnetic and VTEM electromagnetic surveys, ground resistivity, gravity and also completed nine drill holes which totaled 3,472.9 meters. The drilling identified clay alteration and structural disruption in the sandstone and basement rocks which generally indicate that a high-grade uranium mineralization may be present or in the vicinity. In 2016 and 2017, IsoEnergy completed 8,859 meters of drilling, which targeted three east-west magnetic lows, including the Roughrider corridor. The company was able to locate a large zone of clay alteration in the southern magnetic low corridor that is similar to the alteration surrounding the Roughrider deposit. In November 2017, IsoEnergy announced that they had staked the Full Moon, East Rim and Fox properties. The 4,872-hectare Full Moon property is located four kilometers north of Orano’s Moonlight uranium occurrence and is 18 kilometers north of the McClean Lake uranium mill. The property hosts several magnetic low trends with historic conductors, including a piece of the Tuning Fork conductor system that extends from Denison’s Hatchet Lake project. The Full Moon project only has 17 historic drill holes within the land package. The 6,703-hectare East Rim property is made up of seven contiguous claims and sits eight kilometers southwest of the West Bear uranium deposit. The property hosts a 15-kilometer-long northeast trending magnetic low feature linked to metasedimentary stratigraphy and four historic drill holes. However, none of the holes are located on the prospective magnetic low feature. Finally, the 1,374 hectare Fox property is 15 kilometers north of Key Lake and covers a north-south magnetic low trend that runs parallel to the trend that hosts the Millennium uranium deposit. No previous drilling has been done on the property. The Fox property is surrounded by 425 million pounds of U3O8 in mined-out and undeveloped deposits with average grades of 5.2 percent U3O8. Some of the nearby deposits, including Millennium and Gryphon, are basement-hosted deposits. The Carlson Creek property is located 19 kilometers northeast of the McArthur River Mine and is contiguous with UEX’s (TSX:UEX) Christie Lake property which hosts the Paul Bay and Ken Pen basement-hosted uranium deposits. The McArthur River mine hosts a mineral reserve of 336.5 million pounds that grades 10.94 percent U3O8. Regional aeromagnetics conducted on the property have indicated favorable meta-sediments with possible fault structures which may be the extension of the P2 structural corridor that hosts the McArthur River orebodies. Of the six drill holes completed at Carlson Creek, two intersected graphitic pelitic gneiss, the common host for Athabasca uranium mineralization. Additional exploration work is needed on the property. The 2Z Lake Property is located 12 kilometers from the Sand Lake uranium deposit. 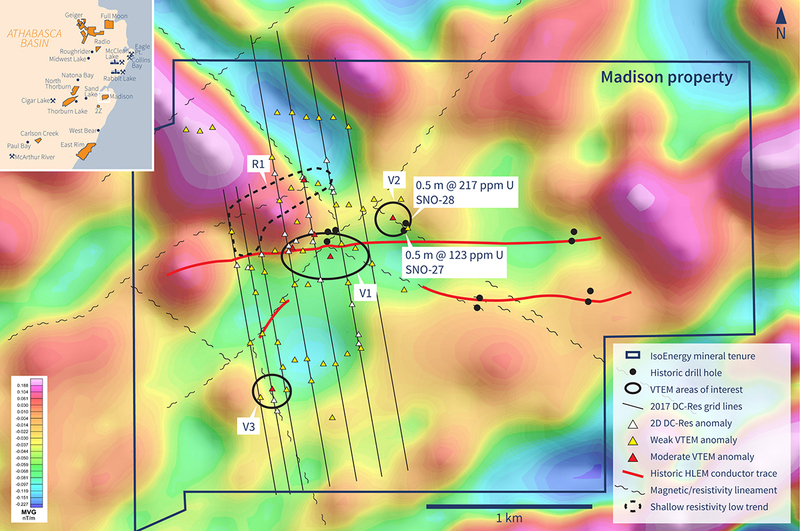 Like the nearby Madison Property, 2Z contains shallow unconformity hosted uranium mineralization in historic drilling. The property remains underexplored with no drilling activity since 1987. Shallow historic drilling intersected up to 0.61 percent U3O8. The mineralized structures and conductors at 2Z remain underexplored, and have discovery potential for of new basement-hosted uranium deposits. The Madison Property is located 14 kilometers from the Sand Lake uranium deposit. Historic drilling conducted by Eldorado Gold Corp. (TSX:ELD;NYSE:EGO), Denison Mines Corp. (TSX:DML)and Cameco totaled 11 holes including an intercept of 217 ppm U3O8. The property contains shallow weak unconformity-hosted uranium mineralization and remains a high priority exploration property. IsoEnergy has completed a 20-line-kilometer DC-resistivity survey on the property and the data has been combined with NexGen’s 2014 airborne electromagnetic survey to identify several drill targets for follow up. In February 2017, IsoEnergy acquired the Mountain Lake uranium deposit in the Hornby Bay Basin through staking. The property consists of five claims for a total of 5,625 hectares and is located 100 kilometers southwest of Kugluktuk, Nunavut. The property was originally discovered in 1976 and has seen intense exploration by Acquitaine Company of Canada and Esso Resources Canada, which completed 190 drill holes for a total of approximately 22,00 meters during the 1970s and 1980s and resulted in the discovery and definition of the Mountain Lake uranium deposit. Between 2005 and 2008, Pitchstone Exploration Ltd. and Triex Minerals Corp. drilled 30 holes, half of which were located within or adjacent to the Mountain Lake deposit. The deposit is 1,300 meters long and 320 meters wide and features a shallow-dipping, tabular zone of strata-bound mineralization that extends from the top of the bedrock to approximately 180 meters below the surface and ranges from 1.0 to 6.5 meters thick. High-grade mineralization has been found in drill intercepts. Notable results include 5.19 percent U3O8 over 0.9 meters. Additionally, Trimex prepared a resource estimate in 2005 for the Mountain Lake deposit, which consists of a historical inferred resource of 8.2 million pounds with an average grade of 0.23 percent U3O8 within 1.6 million tonnes of mineralization. However, more work needs to be done to verify the resource outlined by Trimex. In February 2018, IsoEnergy acquired the Whitewater property through staking in the Athabasca Basin in Saskatchewan. The property consists of 16 contiguous claims and covers 25,966 hectares of the northern rim of the Athabasca Basin. The property was extended in May 2018, when IsoEnergy staked a further 1,562 hectares. Historic grab sample grades from the new land package returned up to 1.36 percent U3O8. In July 2018, the company staked an additional two claims which make up the Whitewater East property. Together, the properties add up to a total of 28,675 hectares. Craig Parry has over 18 years in the resources sector. He is currently President and Chief Executive Officer of IsoEnergy Ltd. and is a Director of NexGen Energy Ltd.
Parry is a co-founder of EMR Capital and a former senior advisor to the Fund. He was a co-founder of the Tigers Realm Group and was appointed to the Boards of Tigers Realm Minerals, Tigers Realm Metals and NexGen Energy Ltd. (as it then was prior to the Qualifying Transaction) in 2011. He was appointed to the role of CEO of Tigers Realm Coal in 2012. Parry, as an exploration and business development geologist, was responsible for the business development activities of the Tigers Realm Group since inception in 2008. Prior to joining Tigers Realm, Parry was the Business Development Manager for G-Resources Limited responsible for mergers and acquisitions and principal geologist – New Business at Oxiana Limited and was responsible for strategy and business development initiatives in bulk and energy commodities. At Rio Tinto, he led exploration programs for iron ore, copper, diamonds, coal and bauxite in Australia, Asia and South America and was principal geologist for the Kintyre Uranium project pre-feasibility study. Parry holds an Honours Degree in Geology and is a Member of the AusIMM. Steve Blower is a professional geologist with over 20 years of experience in the minerals industry including mine geology, resource estimation and exploration for a variety of commodities. For the past 12 years, he has been involved in uranium exploration in the Athabasca Basin, most recently as the VP Exploration for Denison Mines. At Denison, Blower led the team that added 75 million pounds of uranium mineral resources to the Wheeler River project through expansion of the Phoenix deposit and the discovery of the Gryphon basement hosted uranium deposit. Prior to Denison Mines. Blower was President, CEO and a director of Pitchstone Exploration Ltd. until its sale in 2012 to Fission Energy. Blower is a professional geoscientist, holds a B.Sc. degree in Geological Sciences from the University of British Columbia and an MSc. in Geological Sciences from Queen’s university. Richardson is currently the CFO of NxGold Ltd. From 2010 to 2017, she was the Chief Financial Officer of Hillsborough Resources Limited, a privately-owned coal producer. Between 2006 and present, Richardson provided financial consulting services to several publicly listed mining companies, primarily in the gold sector, including Atlantic Gold Corporation, Primero Mining Corp., Yukon-Nevada Gold Corp., Rio Alto Mining Ltd. and Goldgroup Mining Inc. From 1991 to 2006, she was the Director of Group Accounting at Placer Dome Inc. which then operated 17 mines across five countries. At Placer Dome Inc., she was responsible for the financial reporting of global operations and integrating new acquisitions. From 1985 to 1991, Richardson was a manager in the audit group (mining) at Ernst & Young LLP, Toronto. Mr. Curyer has over 20 years of experience in the resources and corporate sector. Mr. Curyer is the current President & Chief Executive Officer of NexGen Energy Ltd. and was previously the Chief Financial Officer and head of corporate development of Southern Cross Resources (now Uranium One). In addition, for three years Mr. Curyer was Head of Corporate Development for Accord Nuclear Resource Management assessing uranium projects worldwide for First Reserve Corporation, a global energy — focused private equity and infrastructure investment firm. Mr. Curyer’s uranium project assessment experience has been focused on assets located in Canada, Australia, USA, Africa, Central Asia and Europe, incorporating operating mines, advanced development projects and exploration prospects. While Chief Financial Officer of Southern Cross Resources (now Uranium One), Mr. Curyer managed the exploration, permitting and feasibility study of the Honeymoon Uranium Project in South Australia, ensuring full compliance with NI43-101 reporting. Mr. McFadden is a lawyer with 21 years’ experience in exploration and mining and is currently the President & Chief Executive Officer of NxGold Ltd., the Chairman of NexGen Energy Ltd. and a Director of IsoEnergy Ltd. Mr. McFadden was previously Manager, Business Development at Newcrest Mining Limited, and before that was Head of Commercial, Strategy and Corporate Development for Tigers Realm Coal Limited, which is listed on the Australian Stock Exchange. Additionally, he was General Manager, Business Development of Tigers Realm Minerals Pty Ltd. Prior to commencing with the Tigers Realm Group in 2010, Mr. McFadden was a Commercial General Manager with Rio Tinto’s exploration division with responsibility for gaining entry into new projects through negotiation with government or joint venture partners, or through acquisition. Mr. McFadden has extensive international experience in managing large and complex transactions and has a broad knowledge of all aspects of project evaluation and negotiation in challenging and varied environments. Mr. McFadden holds a combined law/commerce degree from Melbourne University and an MBA from Monash University. Mr. Thiele has over 30 years of experience in senior finance roles in medium to large Australian ASX listed companies. He has been Chief Financial Officer for companies involved in the Agribusiness sector (Elders and Viterra) and the Biotechnology sector (Bionomics). In these roles he combined his technical accounting and financial skills with commercial expertise thereby substantially contributing to the growth of each of these businesses. During this time, he was actively involved in IPO’s, capital raisings, corporate restructures, mergers and acquisitions, refinancing and joint ventures. *Disclaimer: The profile provides information which was sourced and approved by IsoEnergy in order to help investors learn more about the company. IsoEnergy is a client of the Investing News Network (INN). The company’s campaign fees pay for INN to create and update this profile page, to which links are placed on Investingnews.com and channel newsletters.